PureWay is a leading medical waste disposal company with specialization in collection and management of medical waste services. We execute all our processes while abiding by legislative’s norms and guidelines. Our team is highly committed to delivering you the best medical waste products as well as services, while limiting risk and ensuring safety. Let's start with the basics. What is Medical Waste? Medical waste, often referred to as sharps or biohazardous waste, is any waste contaminated with blood generated during the diagnosis or treatment of humans in a healthcare setting. This includes sharps (needles, syringes, scalpels, dental wires and any object that can penetrate the skin), and regulated waste (biohazardous waste that contains large amounts of liquid/semiliquid blood or other potentially infectious materials). Healthcare professionals are required to properly contain, transport and dispose of sharps and medical waste. Regulations for disposal differ by state and are determined at a federal level by OSHA and at a state level, in some states, by programs such as CAL/OSHA. To look up the regulations for your state, click here. A few states even impose storage limitations on sharps and medical waste that require the "waste generators" (a.k.a., the doctors or dentists producing the waste) to dispose of their waste by a certain period of time after it's been created. Did you know that some states have different storage limitations for sharps and biohazardous waste separately? Our compliance professionals will help explain the requirements for your state and ensure whatever you decide to do helps your facility attain or maintain compliance. Most healthcare facilities don’t know exactly what their regulations require them to do. Because of this they hire a contracted monthly pickup service for their sharps containers and medical waste. This can be costly and involves a complex fee structure that includes monthly fees, fuel surcharges, and scheduled pickups whether needed or not. Most healthcare facilities generate small quantities of sharps and medical waste, and do not require a Semi truck and team of people to come pick up their waste each week or month. Long contracts of 3-5 years and escalating monthly fees make this type of service very expensive and a hassle. In addition to managing the cost of services such as these, the healthcare facility is also forced to manage and purchase separately their containers for sharps and biohazardous waste. What a hassle! There is a better way to dispose of your waste. 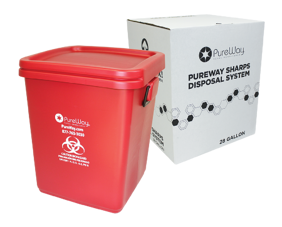 The PureWay ship back system can save medical facilities up to 50% or more off sharps and medical waste disposal cost. Still have questions and want a professional waste specialist to recommend the ideal solution?